We have interviewed Dr Pete from Strategic Website Usability consultants usereffect before. We originally got to know Pete via SEOmoz and had the pleasure of finally meeting him in person in Seattle over the summer. 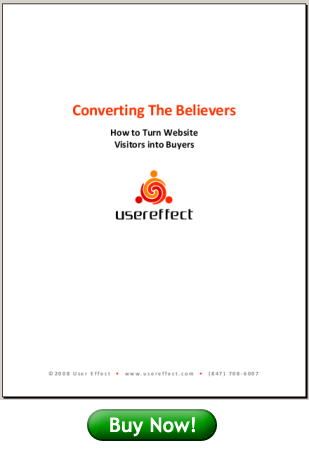 He has been hard at work recently putting together usereffect's first usability ebook entitled "Converting the Believers" which is now for sale for the spectacular price of $19.99 over on his website. Pete very kindly sent us a copy to check out and I can highly recommend it as a great starting point if you are just getting into the website usability and conversion rate testing. It gives a great introduction to website analytics, with some of the clearest explanations of hits, views, visitors and unique visitors I have ever seen along with some great tips for testing and usability (and the combination of those things). > In the U.S. alone, companies spent over $21 Billion last year driving visitors to their websites... For all of the money spent leading believers to the virtual door, though, only a fraction of those companies spent the time and money necessary to convert those believers into buyers. I hope anyone new to the field of usability and testing will go and buy Pete's book (and if you want to go further, I can highly recommend his strategic usability consultancy - you can see what he said about the Distilled website...).